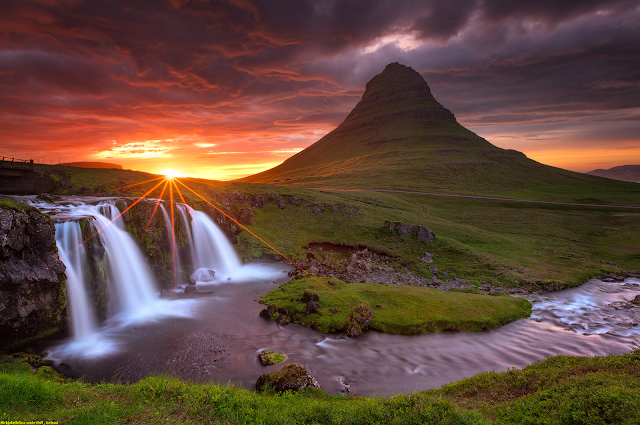 Kirkjufellsfoss waterfall is situated in Kirkjufellsa river and located near the proud mount Kirkjufell by Grundarfjordur town at the northern side of Snaefellsnes peninsula in West Iceland. This beautiful five meter high fall flows in a couple of levels and is divided into three separate spouts. As you stand before the fall you‘ll see the pyramid- shaped mount Kirkjufell towering above, one of the most scenic and beautiful in Iceland. This combination is photogenic to say the least, offering a stunning view and chances of some great pictures.